All Bishop homes currently listed for sale in Bishop as of 04/24/2019 are shown below. You can change the search criteria at any time by pressing the 'Change Search' button below. If you have any questions or you would like more information about any Bishop homes for sale or other Bishop real estate, please contact us and one of our knowledgeable Bishop REALTORS® would be pleased to assist you. "Live Auction! Bidding to start from $450,000! 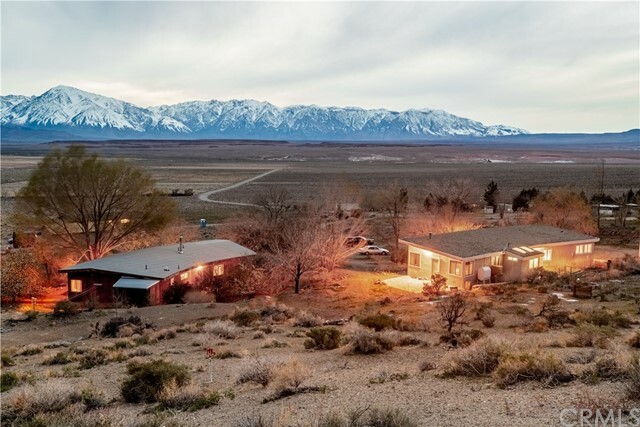 Don t miss this great opportunity to own ten acres of land amidst the captivating Sierra Nevada Mountains. Panoramic, breathtaking views of the mountains can be seen from every direction. With two separate units, there is ample living space for your family and visitors. The main house features 4 bedrooms, 2 bathrooms and the guest house is equipped with 2 bedrooms and 1 bathroom. In Season, pick your fruit every morning straight from own mature orchard! Trees include peach, apple, pear, nectarine, plums, chinese haw, fig, jujube and pomegranate. The natural spring on property produces 8,000 gallons of water per day which is used to irrigate the garden and orchard. For domestic water, the dedicated well is run off solar and electric. Other features of the main house include tile flooring and stunning maple flooring throughout the bedrooms. The two-car garage is fully insulated and set up for a workshop with lots of shelving, cupboards and a work bench. Surrounded by nature, the home is close to all types of outdoor recreation and a vast number of equestrian trails. Privacy, space and location make this home perfect for families or those just wanting to get away from it all!"